Students at Holy Family will participate in multi-culturally based art lessons to expand their knowledge of art as it relates to culture and ethnicity. Each grade level will create work from a different culture/country. The project will culminate with an art exhibit for the school community. Funds will be used to pay for four traveling science demonstrations provided by employees from the Milton J. Rubenstein Museum of Science and Technology. In addition, the grant will allow for the purchase of science materials and manipulatives to reinforce the concepts presented to the students. 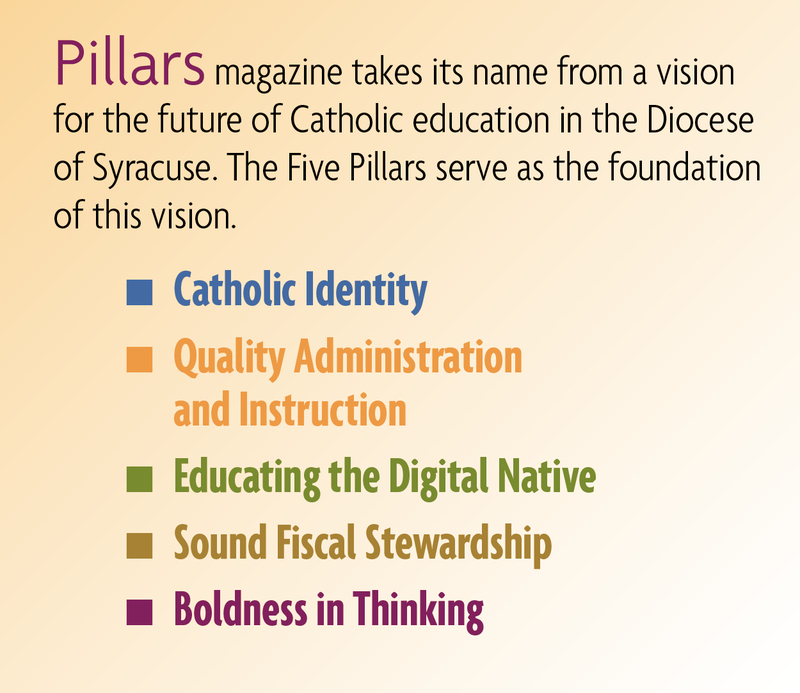 In 2008, the Bishop’s Academy at Holy Family received a partially-funded grant to purchase software, and current funds will be used to renew that initiative. Software programs are designed to work on specific skills, develop student understanding of the computer as a tool, and provide the teacher with a means of assessing student progress. The Bishop’s Academy at Most Holy Rosary will purchase the Fountas and Pinnell literacy intervention system to supplement its reading program. The purchase of the system will help students identified as reading at a low level progress to their current grade level abilities. Power2Achieve is a moral character development program that supports the development of 21st century skills needed by future leaders. The resources available through the grant funding will support the school’s efforts to effectively and efficiently guide students’ moral development and growth of performance character strengths. Bishop Ludden will use the funds to continue its unique House System program by purchasing materials that identify different houses and pay stipends to those who serve as house leaders. This grant is a continuation of one received in 2008 and will be used to purchase netbooks and storage carts so that computers can be shared. In addition, Blessed Sacrament will be able to replace outdated technology and fully integrate technology into the curriculum at every grade level, while also allowing teachers to successfully differentiate the instructional needs of their students. The technology program will be enhanced with the purchase of an additional Smartboard and 10 classroom computers to complete the technology needs of the school. Ticket to Read is a web-based reading intervention program that engages students in high-interest reading content and assists in improving reading performance and skills on an individual basis. The program also can be accessed from home for further practice. Funds will be used for the professional development component of the program. Fox in a Box is a mathematics assessment tool used to determine specific student needs in order to provide early intervention services. The funding allows for the purchase of interactive mathematics and English Language Arts Smartboard applications, as well as two wireless SMARTslates for grades 5 and 6. These applications allow for daily language review, daily math word problems, and daily paragraph editing for grades 3 through 6, as well. Grant monies allow for the purchase of materials and supplies needed to open a second Montessori Pre-K program at Notre Dame. The second class will accommodate 20 more students annually. Dimension M is a new immersive approach to teaching mathematics being offered as a STEM initiative with funding through the Department of Defense and an educational partnership with Rome Air Force Research Lab. Funding will create a new math lab with 12 desktop computers and an overhead projector. WeDO is an introductory robotics program for grades 2 through 4 with activities that cover math, science, technology and engineering, as well as language arts and literacy. TeTrix allows high school students to develop and control powerful DC and servo motors and metal gears and will allow teams of students to develop an engineering system. It is a valuable tool for students hoping to pursue careers in the engineering field and is a direct link to the robotics program offered at SUNYIT. Funding allows for the creation of a junior/senior high school elective and the purchase of five kits that will be assigned to students on a rotating basis. Kits cover the areas of fuel cell cars, solar hydrogen, wind farm technology, and wind and hydro fuel cells. The course will culminate in an activity to design an advanced energy house and run an automobile on alternative energy. Funding was awarded to purchase a second iPad in order for students to work together on various projects. St. Margaret’s will use its funding to purchase a SMARTboard and installation materials, a projector and printer. The technology will allow for endless opportunities for teachers to enhance instruction through visual, hands-on, animate, multi-media lessons in all subject areas. Through the Lego Mindstorm Robotics Program, St. Mary’s will introduce students to programming and basic engineering skills with opportunities to explore, problem solve and use multiple levels of learning in the field of science, mathematics and technology. St. Rose will use grant funding to purchase language arts manipulative materials for hands on activities to enhance skills and concepts. The program will assist students in need of remediation and also will provide challenges for students who are high achievers. Funds will be used to purchase SMARTboards, laptops, and projectors to enhance the St. Rose technology program. Funds will be used to engage reluctant readers and creative minds by drawing students into reading through interaction with several professional writers. Funds will allow the purchase of SMARTboard technology, computer monitors and learning center equipment, including iPods; and pay for teacher workshop expenses. The learning centers will promote student independence, allow students to learn through self-discovery, encourage responsibility and provide time and opportunity for classroom teachers to work with individual students on targeted skills. The Reading First Program was initially instituted by the Oswego Public School District but was cut due to district budgetary restraints. Since then, Trinity Catholic has continued the program. The Program Enhancement Grant funding will be used to pay salaries and provide additional support for students who struggle with reading. * Indicated total reflects some funds that remained from the 2008-2009 grant dispersal.